Visit us for the 2019 Toyota 4Runner in Harrisburg, PA! This SUV provides motorists so many different trim options. Inside the spacious interior of a 2019 Toyota 4Runner, you can hit the highway without a moment's notice. The new Toyota SUV features black roof rails and advanced, durable panel guards. Are you ready for this innovative new SUV model? Let's start by taking note of the 18" and 5-spoke black alloy wheels, which make going off-roading a no-brainer. The new 2019 Toyota 4Runner also features a highly capable Entune™ App Suite as well as an Integrated Navigation system, both of which offer a blend of entertainment and efficiency to the ride. The available heated front seats are also a thoughtful touch. It's no secret that the new 4Runner is a highly efficient model that puts out all of the stops for its passengers. What Else Does the 2019 Toyota 4Runner Offer? 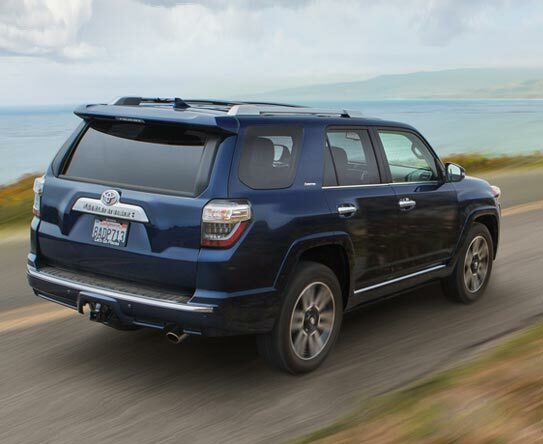 At Freedom Toyota of Harrisburg, we know that your SUV needs to move with you, and the 2019 4Runner has been engineered to handle everything the road throws at it. 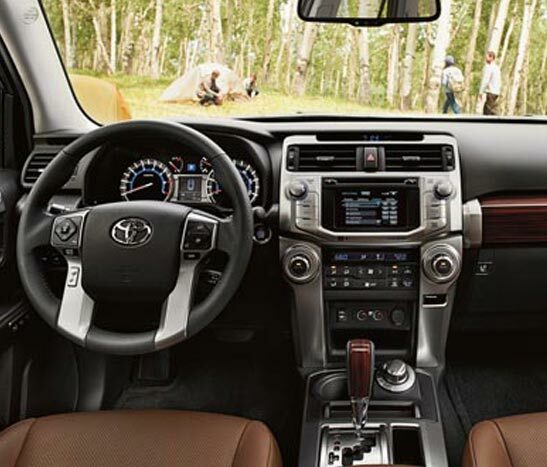 The flexible interior of the 4Runner allows it to offer prime features such as the 60/40 Split Rear Seats. Thanks to the new 4Runner, motorists can experience added space and power on the highway. The 2019 4Runner’s active safety systems are also quite notable, including everything included in the Star Safety System, which we will touch on later. The updated 4Runner also leads with LED headlights with LED Daytime Running Lights, which are amazing. Toyota models are known for being safe and reliable––the 4Runner is no different. The 4Runner highlights side impact door beams that take in all of the energy caused during collisions. There's also a tire pressure monitoring system and eight air bags. Then there's the Star Safety System, which offers an Anti-lock Brake System, Traction Control, Brake Assist, and even an Electronic Brake-force Distribution system! Throw in the added protection of Smart Stop Technology and we'd say that the 4Runner is a pretty safe vehicle. The new 2019 Toyota 4Runner comes with personalized trims that will make your head spin. Drivers will be pleased with the results in the 2019 4Runner SR5 (4X2) base trim all the way up to the new 2019 TRD Pro. Take note that all of the trims come with ToyotaCare, a complementary maintenance plan that will last up to 200,000 miles or two years. ToyotaCare is one of the many added benefits that comes with owning a brand new 4Runner, so contact our professional team and take advantage of it today. 2019 4Runner SR5 (4X2) – The 2019 4Runner SR5 (4X2) features 270 hp @ 5600 rpm and we're just getting started with power. The 4Runner also features RWD with Active Traction Control. The 6.1" touch-screen display will show you exactly what's going on behind you via the backup camera––another notable feature. The 4Runner also comes clad with state-of-the-art features such as an Entune Audio Plus system, trip meters, and average fuel economy; ECO Driving Indicator and warning messages, and an projector beam headlights. 2019 4Runner SR5 Premium (4X2) – The 2019 4Runner SR5 Premium (4X2) offers a 5-speed Electronically Controlled automatic Transmission with intelligence (ECT-i) and a sequential shift mode with a powerful 4.0L V6 engine. Then there's the heated power outside mirrors with turn-signal indicators and a towing capacity of 5000 pounds. Let's not forget the Integrated Navigation system that let's you find your way back home! 2019 4Runner TRD Off-Road (4x4) – Ask about the amazing deck rail system with four adjustable tie-down cleats and the amazing Entune™ Premium Audio with Integrated Navigation system with its App Suite and Siri Eyes Free capabilities! Don't forget to ask about the innovative HD Radio™ with Predictive Traffic and Doppler Weather overlay! Be sure to also inquire about the SiriusXM Radio options. Ask about our leather-trimmed and heated front bucket seats as well. Contact us about the other features like the power sliding horizontal rear window, and optional moonroof. 2019 4Runner TRD Off-Road Premium – The 2019 4Runner TRD Off-Road Premium comes standard with Heated power outside mirrors with turn signal indicators, Roof rails, "TRD Off-Road" external hard badges, and 17-in. 7-spoke alloy wheels, and color-keyed front and rear bumpers with silver accents. The interior received quite the upgrade as well, as it now features a cargo area with added space, a locking rear differential, sofTex-trimmed heated and power adjustable front seats and TRD Off-Road external hard badges, and much more. Contact us and ask about the fold-flat second-row seats and a Leather-trimmed steering wheel with controls! 2019 4Runner Limited (4x2) – The new 2019 Limited (4x2) trim features Dual zone automatic climate control with 20" split 6-spoke wheels, leather-trimmed heated seats with outside temperature, and an average fuel economy and distance to empty. Then there's the stylish interior with its perforated leather-trimmed heated and ventilated front seats, which make even the longest rides more comfortable than ever. 2019 TRD Pro – The new 2019 TRD Pro features an exterior that will turn heads. This trim level features a power rear liftgate window with auto up/down, and jam protection, black interior accents, and power door locks with programmable auto door lock logic. The vehicle also has an amazing selection of safety features, including the dual zone automatic climate control, Overhead console with Active Traction Control (A-TRAC), VSC cutoff, locking rear differential and Crawl Control (CRAWL) switches. Then there's the Multi-terrain Select and the HomeLink® universal transceiver. Limited Nightshade Edition – This is a model with 17" matte-black TRD alloy wheels, FOX shocks with TRD-tuned front springs, Hill Start Assist Control, and a locking rear differential. There's also a SofTex-trimmed heated and power adjustable front seats which further adds to the mystic of the new Nightshade Edition. If you're looking to explore the world is a luxurious 4Runner, choose this model for its chrome door handles with touch-sensor lock/unlock systems. Are you ready to shop for the new 2019 Toyota 4Runner? As your go-to Toyota dealer in Harrisburg, PA, we invite you to test drive the new 4Runner today. Slide into the cozy new 4Runner interior and see why it is making moves! If you are ready to buy a new Toyota SUV in Harrisburg, PA, visit us. We'll set you up with our expert finance department and even help you appraise your trade-in model. Be sure to go ahead and schedule automotive service with 4Runner that has access to ToyotaCare, a no-cost maintenance plan. There's plenty to love about the new 4Runner, so get down here and see what all the hype is about!